Let me start out by saying that I have had a chance to test out many different android tablet PC's over the year, and after powering up this device I was blown away! This 7-in Dual-Core Tablet is absolutely phenomenal, with tons of perks that have never been offered all together into a single android tablet. First and for most, this device uses the latest Action ATM7021 Dual Core 1.2GHz processor, and is insanely fast. It responds instantly and has plenty of power to run multiple programs, browsers, apps, music and video at the same time. It has built in Google Maps application with GPS navigation, so you can tether it to your mobile phone plan, mount it in your car and use it as a Touch Screen Navigation device. For the price this is by far the greatest Android Tablet PC I have ever sell. 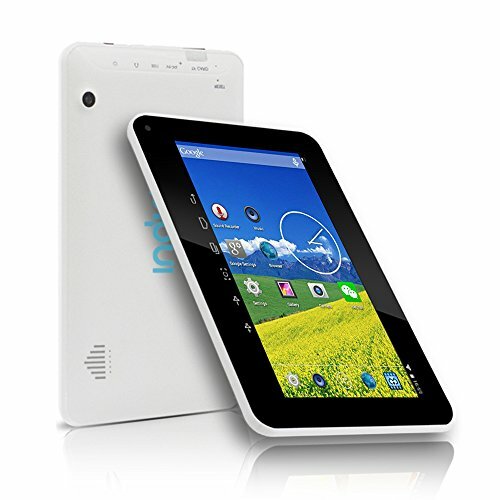 The tablet is equipped with the latest Google Android 4.2 Jelly Bean OS with full access to the REAL Google Play Store Market. This is a recommended Tablet Computer in the market with superior design, easy application and top performance. It is installed with mobile Internet and multimedia device, support general applications including game, education, business and home entertainment. This Tablet PC features fast speed and stronger performance, has a system that can upgrade and support multiple programs at the same time. Let the advanced technology change your burdensome life and work! Gorgeous appearance: 7-inch HD Capacitive Multi-Touch Screen with Luxury Leather Back Cover - Luxurious to Feel, to touch, to admire - Great Gift idea! Support Wi-Fi 802.11 b/g/n letting you get connected to the web wirelessly. Whether you're downloading, streaming, surfing or connecting to the cloud.